Lance Corporal Val Lander of 1/13th Battalion, The London Regiment, fought and died at the Battle of Aubers Ridge on the Western Front. He was 21 years old. On 9 May 1915 the British made a two-pronged attack on the German line in support of a French offensive at Artois. The southern thrust, consisting of the Indian Corps and British I Corps, aimed towards Aubers Ridge, while IV Corps, 5km (3 miles) to the north, headed for Fromelles. The artillery barrage, however, was too light and inaccurate and there were delays in sending forward reinforcements. Much of the German wire remained uncut and by the following morning the British had been forced back to their start line, having suffered 12,000 casualties. 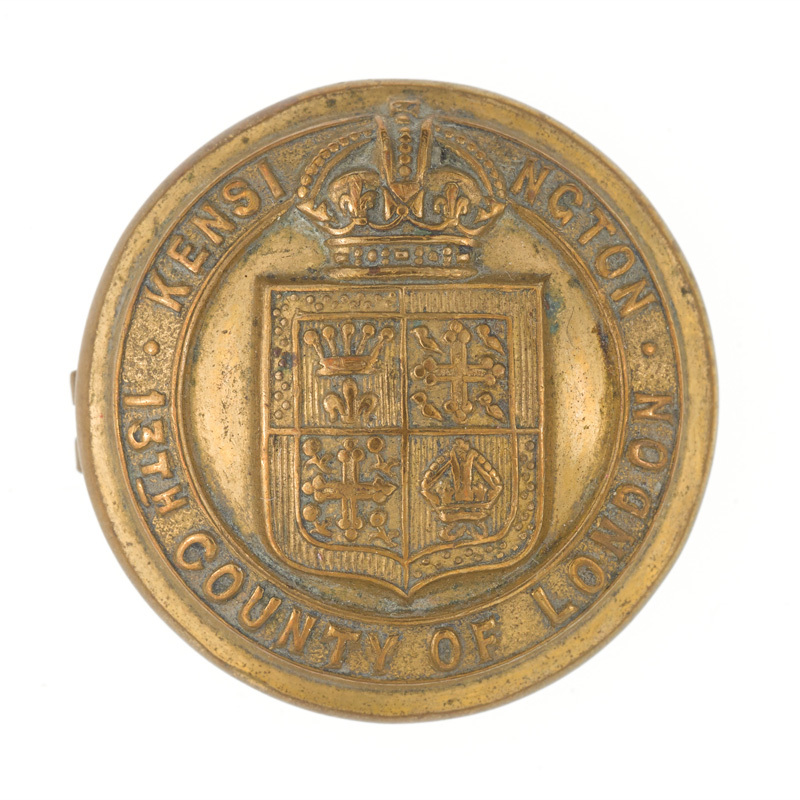 Among the units engaged that day was 1/13th (County of London) Princess Louise’s Kensington Battalion, The London Regiment, who attacked with 25th Brigade. They advanced further than most, assaulting an area where the wire had been relatively well cut. Having infiltrated the enemy front trenches and consolidated a 250-yard stretch, they moved on to their next objective. craters, moved forward to capture Delangre Farm and then formed a defensive flank. Unfortunately, they could not hold on to this position and after hours of bitter fighting were forced back. 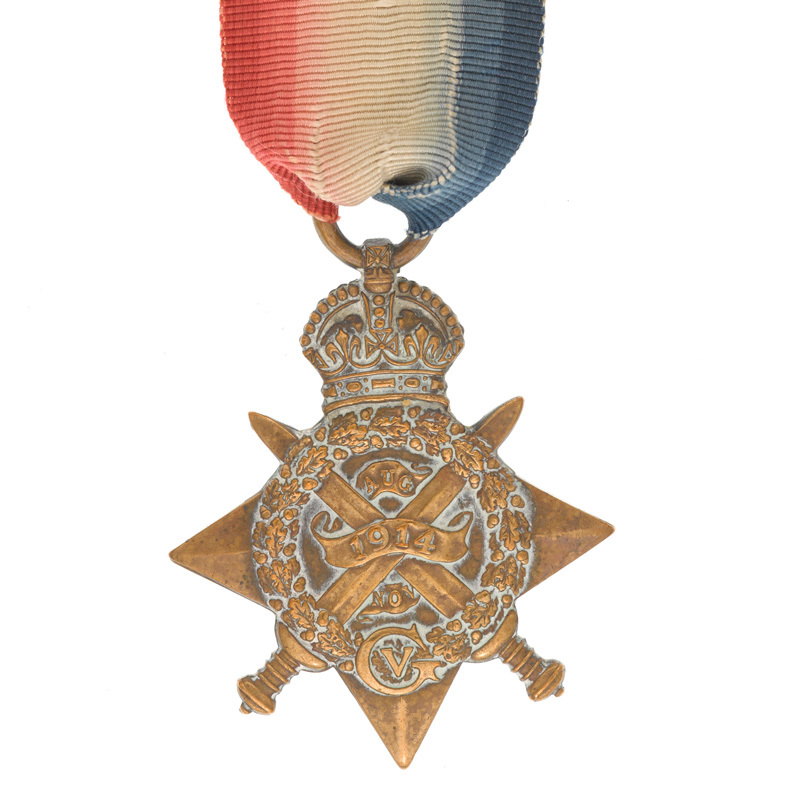 The Kensington’s lost 13 officers and 423 other ranks killed or wounded at Aubers Ridge. The operation showed that the British Army was not yet ready to take on and defeat the Germans on the Western Front. 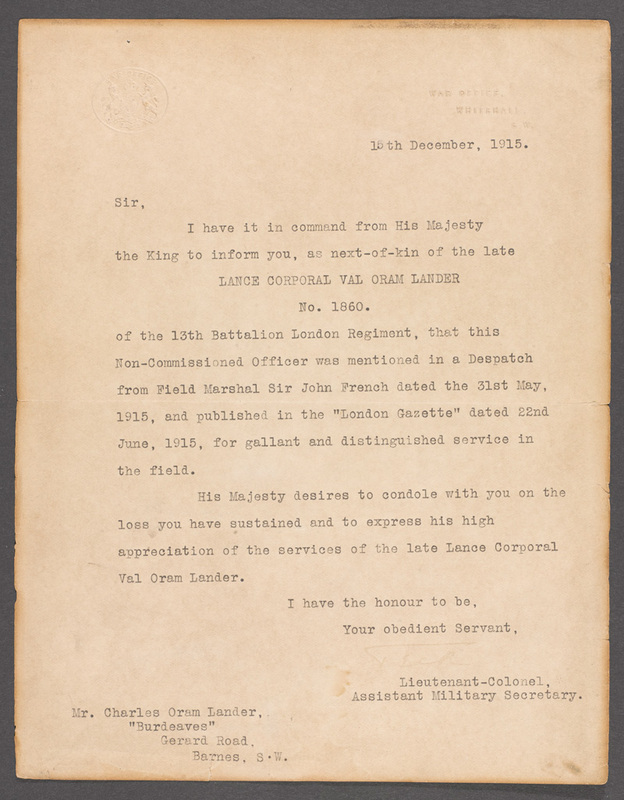 The National Army Museum holds a collection of objects relating to Lance Corporal Val Lander of the Kensingtons, who was killed during the struggle at Aubers Ridge. He was later Mentioned in Despatches for his bravery during the fighting. Lander’s details are also listed in the Soldiers’ Effects ledgers created by the War Office to record the monies owing to soldiers who died while serving in the Army. The National Army Museum holds the records from 1901 to 1960, covering the latter stages of the Boer War (1899-1902) and both World Wars. The ledgers list a soldier’s name, rank, regiment, date (and sometimes place) of death, but perhaps most importantly they give the name of the deceased’s next of kin. Family historians often have to research several men with the same name in order to work out which is their ancestor. This is most often the case with First World War soldiers, as so many of their service records were lost during the Second World War bombing of the National Archives. 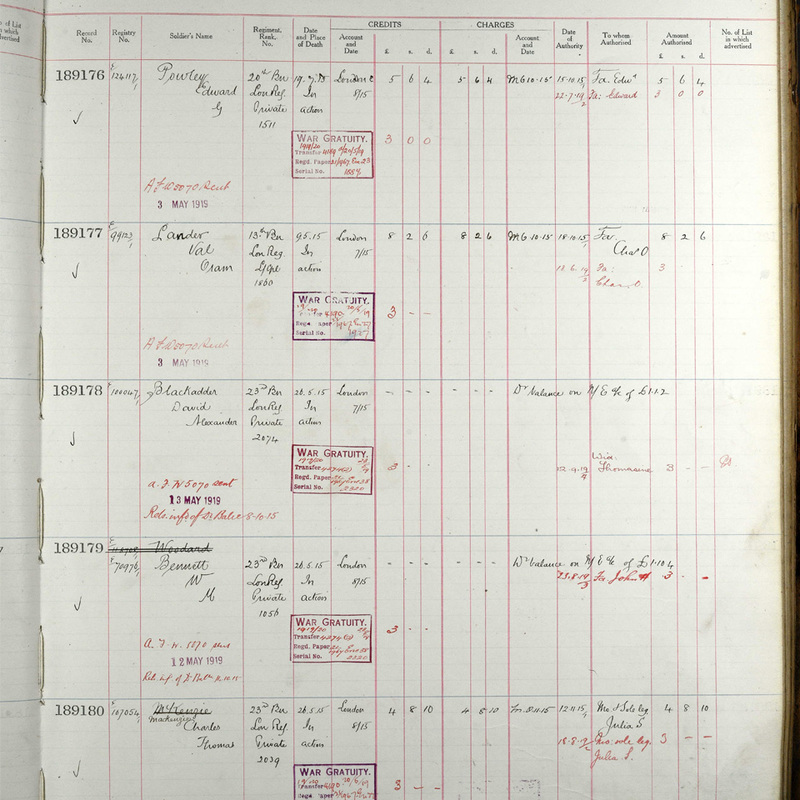 By providing the name of the next of kin, the Soldiers’ Effects records can sometimes provide the only existing evidence of this crucial family link. The monies awarded to a soldier’s next of kin consisted of his balance of pay, plus a gratuity that was paid out after the war. These amounts are incredibly small to our modern way of thinking, sometimes even just a couple of pounds or a few shillings. Payments would be awarded to a soldier’s widow or, if he was not married, to one of his parents. Lander’s father received the sum of £8 two shillings and four pence. However, a significant majority of the First World War payments went to soldiers’ mothers. This not only points to how many widows there were in Britain at the time (the money would usually go to a soldier’s father if he was alive), but also perhaps to the general youth of the British Army, with so many of those going to war never having married. Val Penruddock Oram Lander (1894-1915) was born on 14 February 1894. He was the second eldest of six children (two boys and four girls) born to Charles Oram Lander, an actor, and Emily Mary Penruddock Lander (née Clarke) of 13 Tavistock Place, Acton. The family moved to 55 Fulham Park Gardens soon after Val’s birth. He attended school in the Fulham area. By 1911, his family had moved to 10 Ormiston Grove in Shepherd’s Bush and Val had become a student, preparing for a career in the mercantile service. Following the outbreak of war in August 1914, Val enlisted in Kensington, joining 1/13th (County of London) Princess Louise’s Kensington Battalion, The London Regiment. 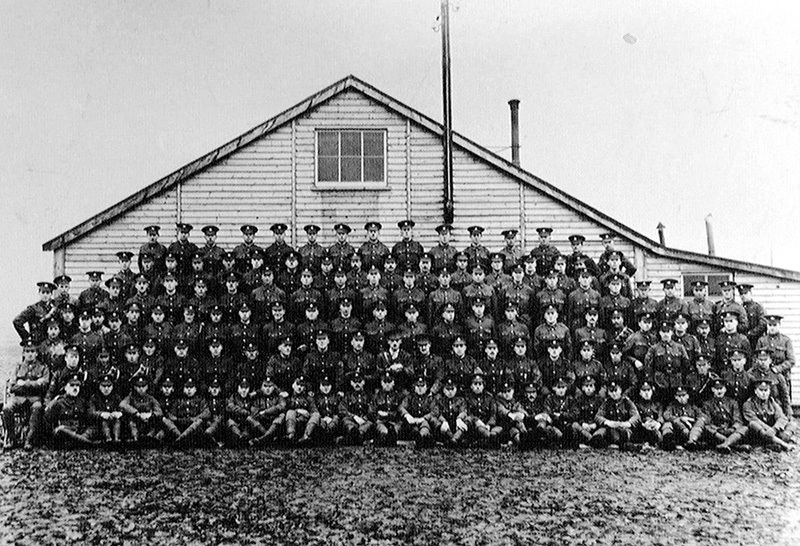 Following mobilisation his unit moved to Abbotts Langley in November 1914 and landed at Le Havre on 13 November with 25th Brigade of 8th Division. 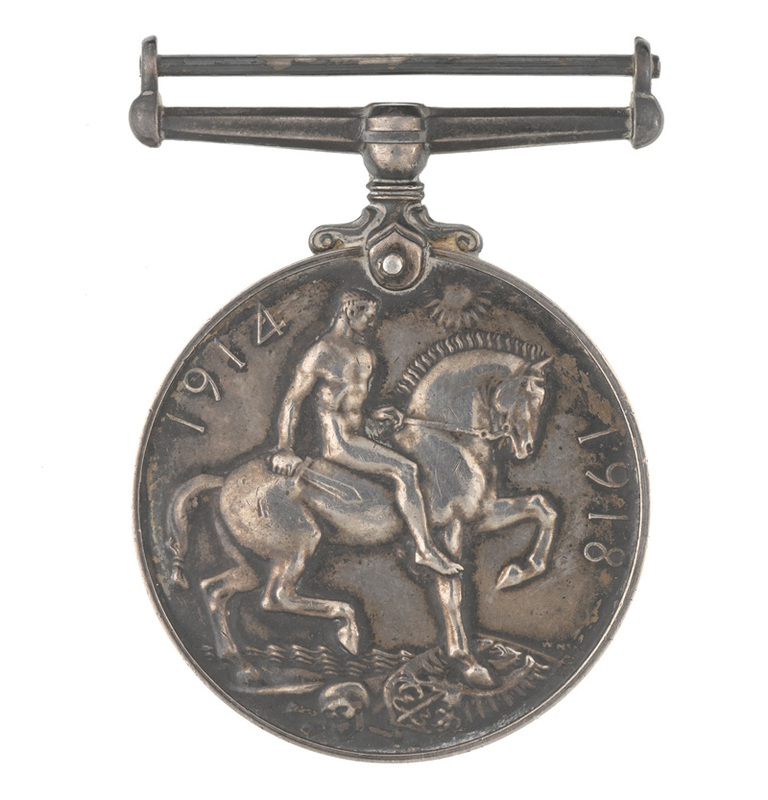 Val was promoted to lance corporal in early 1915. After a few months in the line near Laventie, he fought with his battalion at Neuve Chapelle in March. The Kensingtons lost 160 men in that battle. Val’s body was never found in the aftermath of the Battle of Aubers Ridge. He is commemorated on the Ploegsteert Memorial at Hainaut, to the south of Ypres.